As a CHURCH, we are all about Jesus. WE ARE A MESS. WE ARE BROKEN PEOPLE. Within our walls, you will find loving and friendly people, but you will find people broken with sin. Broken with some weighty challenges. Yet, not broken beyond repair. WE ARE FORGIVEN. By the love of Jesus on the cross, we are restored. We are promised that this forgiveness will be there for us our whole life no matter what we do wrong. We are a worshiping church not because we have it all together, but because we know one who puts it all together. WE ARE CHRISTIAN. Those covered with the love of Jesus are, as a result, seen as perfect by the creator of the world. We are given faith though the work of the spirit and the waters of baptism. We are then called to follow Jesus. Not to earn our salvation, but because Jesus first loved us. We as a church strive to follow Jesus and rest in his love when we fail to do that. WE HAVE ANCIENT ROOTS: We confess a creed, The Apostles Creed, written 1700 years ago based on the Bible written 2000 years ago. This book, the Bible, is God's gift to us and one we read and study, teach and preach about. We, like those before us, put a significant emphasis on God's gifts to us. That is: God's word, baptism, and communion. We believe that God works through these means to create and maintain our faith. WE ARE CONNECTED TO THE LCMS. We are affiliated with the Lutheran Church - Missouri Synod, a denomination that draws its start from the Protestant Reformation in 1517, when Martin Luther - among other things - told the Catholic Church that we could not do anything to earn our salvation, but that Christ paid the price in full. 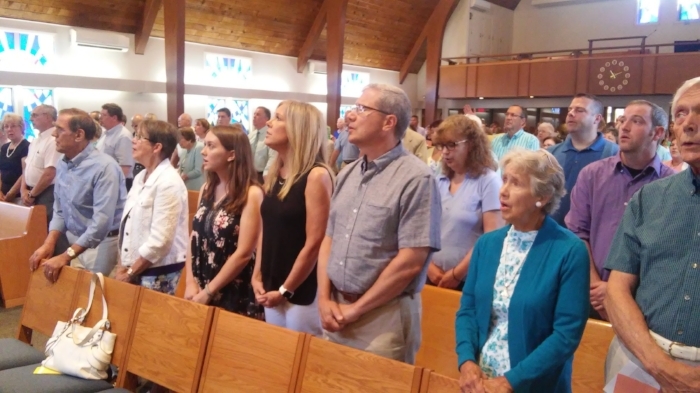 We believe that being a part of this body helps keep us faithful to the word of God first and foremost and the 2000 years of history of the church. WE ARE STRIVING TO BE FAITHFUL TO CHRIST EVEN AS THE WORLD CHANGES AROUND US. Jesus and his words don't change but the world does. We strive to be method-flexible to keep up with the changing world, yet always keeping in step with God's will for us as a church and individual Christians. We realize that this is a challenging thing to balance, but it is an important thing for us to do. WE ARE DIVERSE. We are made up of people from different communities, ages, backgrounds, and occupations. We seek to serve people of all ages, offering programs and ministries from birth through retirement. Christian education, fellowship, service, and caring ministries are offered to everyone. We are seeking to meet the diverse needs of 21st century Christians. WE ARE IN DELMAR, NEW YORK. Located in suburban Albany County, our members come from communities around the Capital District. As an active part of the Capital District, we are involved with many local ministries. Through our national and international connections, we are able to spread the "Good News" and meet human needs throughout the world. Find us on a MAP. WE WILL BE MORE EFFECTIVE IF YOU JOIN US. We believe that all people are created in God's image and are called to his "priesthood". That is, we are all created to serve God and one another. The more we build each other up in the love of Christ, the more we will do for the kingdom of God. We think that you can be an important part of this God-pleasing effort.